The elevated swimming pool on the upper deck of 63.5 metre Lioness V features sleek stone steps and is surrounded by soft sunpads, where there are concealed speakers so guests can listen to music while they soak or sunbathe. It's the perfect spot to catch some rays, enjoy a cocktail and relax. She also boasts a generous swim platform for those who would rather cool off by jumping into the sea. Delivered by Benetti in 2006, she features contemporary interiors with accommodation for up to 12 guests in six cabins with a crew of 19. Other highlights include a gym and steam room, a sumptuous cinema and an additional lounge boasting a traditional gentleman's club feel. Managed for charter by Camper & Nicholsons, she has a weekly charter rate starting from €425,000 in the summer season and $425,000 in the winter. The elevated swimming pool on the upper deck of 63.5 metre Lioness V features sleek stone steps and is surrounded by soft sunpads, where there are concealed speakers so guests can listen to music while they soak or sunbathe. It's the perfect spot to catch some rays, enjoy a cocktail and relax. She also boasts a generous swim platform for those who would rather cool off by jumping into the sea. Delivered by Benetti in 2006, she features contemporary interiors with accommodation for up to 12 guests in six cabins with a crew of 19. Other highlights include a gym and steam room, a sumptuous cinema and an additional lounge boasting a traditional gentleman's club feel. Managed for charter by Camper & Nicholsons, she has a weekly charter rate starting from €425,000 in the summer season and $425,000 in the winter. Boasting a beautiful glass-sided Jacuzzi on her forward sundeck, the 85.6 metre Derecktor superyacht Aquila offers an idyllic setting for those who don't want to be out of the water for too long. In addition to her spa pool, she boasts a stunning beach club, meaning guests can dive straight into the ocean while at anchor. Aquila is managed for charter by Burgess, had has a low season weekly rate of €945,000 and a high season rate of €1,000,000. Boasting a beautiful glass-sided Jacuzzi on her forward sundeck, the 85.6 metre Derecktor superyacht Aquila offers an idyllic setting for those who don't want to be out of the water for too long. In addition to her spa pool, she boasts a stunning beach club, meaning guests can dive straight into the ocean while at anchor. Aquila is managed for charter by Burgess, had has a low season weekly rate of €945,000 and a high season rate of €1,000,000. 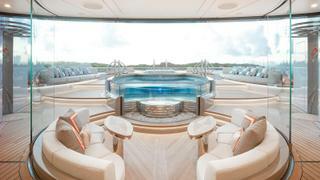 Boasting a glass wall facing the sundeck cocktail bar, the 7,000 litre pool on board Sunrise 63.1 metre Irimari offers the perfect spot for guests to relax. Alternatively, guests can unwind inches away from the surface of the ocean courtesy of a fold down beach club with balconies on either side. Additionally, her master en-suite bathroom boasts a vast and contemporary bathtub for those who prefer to spend an evening soaking with a good book. Managed for charter by Ocean Independence, she has a weekly charter rate starting from €460,000 in the low season and €490,000 in the high season. 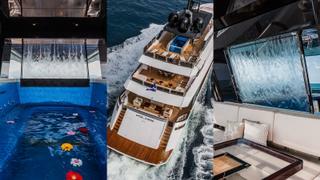 Boasting a glass wall facing the sundeck cocktail bar, the 7,000 litre pool on board Sunrise 63.1 metre Irimari offers the perfect spot for guests to relax. Alternatively, guests can unwind inches away from the surface of the ocean courtesy of a fold down beach club with balconies on either side. Additionally, her master en-suite bathroom boasts a vast and contemporary bathtub for those who prefer to spend an evening soaking with a good book. Managed for charter by Ocean Independence, she has a weekly charter rate starting from €460,000 in the low season and €490,000 in the high season. Take a dip in the four metre swimming pool on board 48.3 metre Polaris I, which features a glass and titanium waterfall – it's the perfect spot for watching the sunset with a glass of bubbly. Also boasting a cosy sauna within the beach club and a generous swimming platform with a drop-down staircase for easy sea access, this 2014 RossiNavi superyacht is a great choice for those who wish to spend their entire vacation in the water. Managed for charter by Camper & Nicholsons, Polaris I has a weekly rate starting from €210,000. Take a dip in the four metre swimming pool on board 48.3 metre Polaris I, which features a glass and titanium waterfall – it's the perfect spot for watching the sunset with a glass of bubbly. Also boasting a cosy sauna within the beach club and a generous swimming platform with a drop-down staircase for easy sea access, this 2014 RossiNavi superyacht is a great choice for those who wish to spend their entire vacation in the water. Managed for charter by Camper & Nicholsons, Polaris I has a weekly rate starting from €210,000. The 82 metre Alfa Nero, delivered by Oceanco in 2007, boasts a seven metre infinity pool on the main deck aft that can be converted into a shallow paddling pool, helipad or dance floor. With two additional spa pools, a cooling mist system available on the outside decks and a plethora of toys, she's the ideal option for water lovers this winter. Managed for charter by Royale Oceanic, Alfa Nero can accommodate up to 12 guests on board with a crew of 26. The 82 metre Alfa Nero, delivered by Oceanco in 2007, boasts a seven metre infinity pool on the main deck aft that can be converted into a shallow paddling pool, helipad or dance floor. With two additional spa pools, a cooling mist system available on the outside decks and a plethora of toys, she's the ideal option for water lovers this winter. 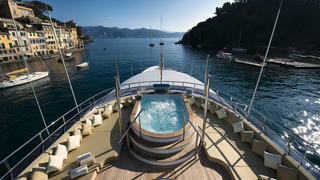 Managed for charter by Royale Oceanic, Alfa Nero can accommodate up to 12 guests on board with a crew of 26. Seemingly designed with water babies in mind, the 52 metre Sanlorenzo 52 Steel yacht Seven Sins boasts a glass-bottomed swimming pool —complete with 12 tonnes of water, glass panel walls and sophisticated lighting for nighttime dips — above an expansive water-level beach club, with access to the sea from fold-out balconies on either side. Additionally, the centrefold of this superyacht beach club can be transformed into a float-in tender garage. Managed for charter by YPI, Seven Sins can accommodate up to 10 guests in five cabins. Seemingly designed with water babies in mind, the 52 metre Sanlorenzo 52 Steel yacht Seven Sins boasts a glass-bottomed swimming pool —complete with 12 tonnes of water, glass panel walls and sophisticated lighting for nighttime dips — above an expansive water-level beach club, with access to the sea from fold-out balconies on either side. Additionally, the centrefold of this superyacht beach club can be transformed into a float-in tender garage. Managed for charter by YPI, Seven Sins can accommodate up to 10 guests in five cabins. Boasting both a 7.5 metre counterflow pool on the aft deck, the floor of which can be raised to add space to the deck, a 3 metre plunge pool surrounded by sunpads forward on the sundeck and a Jacuzzi over the bow, the 88.5 metre Nirvana is perfect for those happier in the water than out. 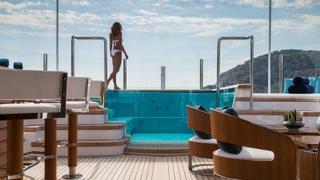 Delivered in 2012 by Oceanco, she can sleep up to 12 guests in six cabins. Other highlights include a fully equipped gym, a games room complete with poker table, a cinema with tiered seating and a luxurious spa. Managed for charter by Edmiston, she is available in the Indian Ocean this winter. Boasting both a 7.5 metre counterflow pool on the aft deck, the floor of which can be raised to add space to the deck, a 3 metre plunge pool surrounded by sunpads forward on the sundeck and a Jacuzzi over the bow, the 88.5 metre Nirvana is perfect for those happier in the water than out. 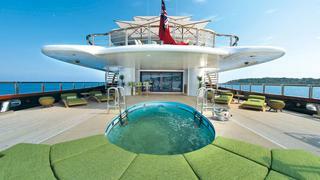 Delivered in 2012 by Oceanco, she can sleep up to 12 guests in six cabins. Other highlights include a fully equipped gym, a games room complete with poker table, a cinema with tiered seating and a luxurious spa. Managed for charter by Edmiston, she is available in the Indian Ocean this winter. A Soviet icebreaker turned explorer yacht, 77.4 metre Legend has a range of 7,640 nautical miles, and her superyacht spa pool is equally as impressive. When cruising through the chilly waters of Northern Europe this summer, up to 16 people can enjoy a dip in the pool, which is fed by a cascading waterfall. If it's too breezy up on deck, guests can head to the Balinese spa to enjoy the sauna, Jacuzzi and beauty salon. Delivered in 1973 by IHC Verschure and refitted in 2016 by Icon Yachts, Legend can sleep up to 26 guests in 13 cabins, with a crew of 19. She is managed for charter by Camper & Nicholsons. A Soviet icebreaker turned explorer yacht, 77.4 metre Legend has a range of 7,640 nautical miles, and her superyacht spa pool is equally as impressive. When cruising through the chilly waters of Northern Europe this summer, up to 16 people can enjoy a dip in the pool, which is fed by a cascading waterfall. If it's too breezy up on deck, guests can head to the Balinese spa to enjoy the sauna, Jacuzzi and beauty salon. Delivered in 1973 by IHC Verschure and refitted in 2016 by Icon Yachts, Legend can sleep up to 26 guests in 13 cabins, with a crew of 19. She is managed for charter by Camper & Nicholsons. 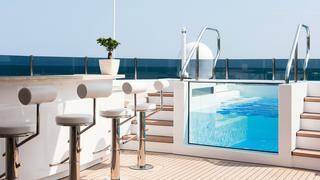 Coral Ocean's large superyacht swimming pool is located at the centre of her spacious sundeck. It features a mosaic of the iconic Coral Ocean motif as well as an underwater porthole window through to the spa area. Alternatively, real water babies can luxuriate in the steam room, which also boasts beautiful mosaics, just a few steps from the sundeck. Delivered by Lürssen in 1994, the 72.6 metre superyacht can sleep up to 12 guests in six rooms and is managed for charter by Burgess. 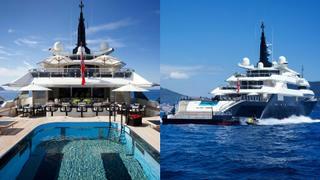 Coral Ocean's large superyacht swimming pool is located at the centre of her spacious sundeck. 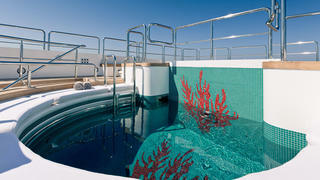 It features a mosaic of the iconic Coral Ocean motif as well as an underwater porthole window through to the spa area. Alternatively, real water babies can luxuriate in the steam room, which also boasts beautiful mosaics, just a few steps from the sundeck. Delivered by Lürssen in 1994, the 72.6 metre superyacht can sleep up to 12 guests in six rooms and is managed for charter by Burgess. Savannah's nine metre superyacht pool is enough to get her on our list, but her beautiful Jacuzzi and vast beach platform really swing it. Have a paddle on deck and simply stroll the few steps to the swimming platform so you can dive into the ocean. Delivered in 2015 by Feadship, 83.5 metre Savannah also has a luxurious spa and Hammam on board for ultimate relaxation. Savannah can accommodate up to 12 guests in six cabins and is managed for charter by Edmiston & Company. Savannah's nine metre superyacht pool is enough to get her on our list, but her beautiful Jacuzzi and vast beach platform really swing it. Have a paddle on deck and simply stroll the few steps to the swimming platform so you can dive into the ocean. Delivered in 2015 by Feadship, 83.5 metre Savannah also has a luxurious spa and Hammam on board for ultimate relaxation. Savannah can accommodate up to 12 guests in six cabins and is managed for charter by Edmiston & Company. The Wellesley’s beautifully designed Art Deco interior is perfectly complemented by her splash pool with a waterfall, located on the top deck. With space for up to eight guests and surrounded by sun pads it’s the social epicentre of the yacht. 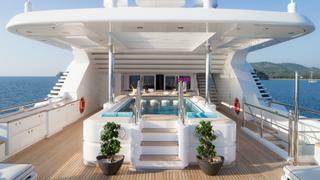 The top deck of the 56.2 metre yacht is also home to a bar and BBQ for further relaxation on board. The Wellesley can host up to 12 guests and is managed for charter by Thompson, Westwood & White Yachts. The Wellesley’s beautifully designed Art Deco interior is perfectly complemented by her splash pool with a waterfall, located on the top deck. With space for up to eight guests and surrounded by sun pads it’s the social epicentre of the yacht. 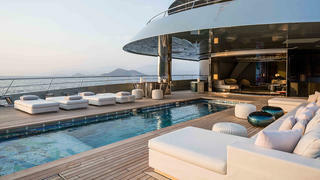 The top deck of the 56.2 metre yacht is also home to a bar and BBQ for further relaxation on board. The Wellesley can host up to 12 guests and is managed for charter by Thompson, Westwood & White Yachts. As you would expect from a yacht that can accommodate up to 26 guests there are multiple options for having a splash around while on board Sherakhan. Her standout feature is her 18-person Jacuzzi which is glass bottomed so that it floods the atrium beneath with light. She also has a hand-crafted mosaic Jacuzzi in her expansive spa area. The lucky occupants of her vast master suite also have a further option as it has a private Jacuzzi. Sherakhan is managed for charter by Y.CO. As you would expect from a yacht that can accommodate up to 26 guests there are multiple options for having a splash around while on board Sherakhan. Her standout feature is her 18-person Jacuzzi which is glass bottomed so that it floods the atrium beneath with light. She also has a hand-crafted mosaic Jacuzzi in her expansive spa area. The lucky occupants of her vast master suite also have a further option as it has a private Jacuzzi. Sherakhan is managed for charter by Y.CO. 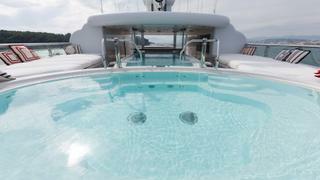 A perfect yacht for relaxation and pampering Titania has a large Jacuzzi pool with swim-up bar on her top deck. It is the perfect place to relax after making the most of her dedicated spa room and on board massage therapist. If you are looking for some swimming action in the ocean a complete water park can also be deployed from the beach club to provide a safe splash zone, inflatable slide, trampoline and climbing frame. Titania can accommodate 12 guests and is managed for charter by Burgess. 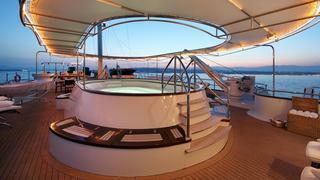 A perfect yacht for relaxation and pampering Titania has a large Jacuzzi pool with swim-up bar on her top deck. It is the perfect place to relax after making the most of her dedicated spa room and on board massage therapist. If you are looking for some swimming action in the ocean a complete water park can also be deployed from the beach club to provide a safe splash zone, inflatable slide, trampoline and climbing frame. Titania can accommodate 12 guests and is managed for charter by Burgess. As you would expect from one of the most expensive yachts for charter Kismet has multiple options if you want to swim while on board. Located on her upper foredeck is a beautiful mosaic tiled pool with an inset Jacuzzi while her spa area offers a further spa pool and cold plunge pool. Her swimming facilities also have green credentials as they use a “closed loop system” which allows for the water to be heated via her exhaust. Kismet can accommodate 12 guests and is managed for charter by Moran Yacht & Ship. As you would expect from one of the most expensive yachts for charterKismet has multiple options if you want to swim while on board. 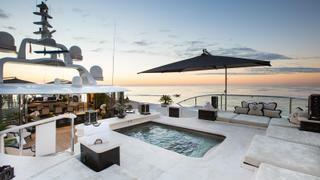 Located on her upper foredeck is a beautiful mosaic tiled pool with an inset Jacuzzi while her spa area offers a further spa pool and cold plunge pool. Her swimming facilities also have green credentials as they use a “closed loop system” which allows for the water to be heated via her exhaust. Kismet can accommodate 12 guests and is managed for charter by Moran Yacht & Ship. There is no denying that Okto’s large swimming pool is one her standout features. The six metre pool can be filled with either sea or fresh water and can be heated or cooled with the use of a contraflow current. Its open position gives you breathtaking views while you swim. Okto can accommodate 11 guests and is managed for charter by Y.CO. There is no denying that Okto’s large swimming pool is one her standout features. The six metre pool can be filled with either sea or fresh water and can be heated or cooled with the use of a contraflow current. Its open position gives you breathtaking views while you swim. 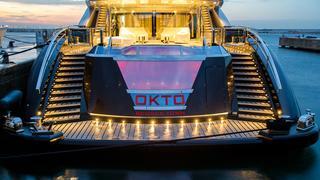 Okto can accommodate 11 guests and is managed for charter by Y.CO. 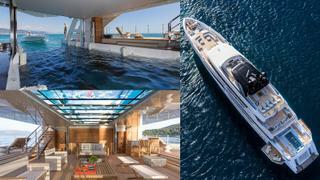 Following an extensive refit Icon now boats a five metre infinity swimming pool. With glass elements to the front and stern above the transom, and a glass bottom that brings a flood light to the beach club below, Icon is one of the best charter yachts to swim on. With sun pads on either side, you can go from water to relaxation in seconds, venture down to the beach club area below, or to the Jacuzzi and sun lounging pads on her sun deck. Icon accommodates 12 guests and is managed for charter by bluewater. 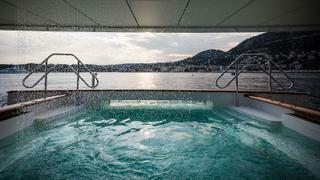 Following an extensive refit Icon now boats a five metre infinity swimming pool. With glass elements to the front and stern above the transom, and a glass bottom that brings a flood light to the beach club below, Icon is one of the best charter yachts to swim on. With sun pads on either side, you can go from water to relaxation in seconds, venture down to the beach club area below, or to the Jacuzzi and sun lounging pads on her sun deck. Icon accommodates 12 guests and is managed for charter by bluewater. Located forward and offering both privacy and panoramic views 78.4 metre TVoffers a stunning 16-person Jacuzzi and swimming jet pool. The pool is also served by a full bar aft making it the perfect place to cool off and enjoy time with friends. TV can accommodate 12 guests and is managed for charter by Edmiston & Company. Located forward and offering both privacy and panoramic views 78.4 metre TVoffers a stunning 16-person Jacuzzi and swimming jet pool. The pool is also served by a full bar aft making it the perfect place to cool off and enjoy time with friends. TV can accommodate 12 guests and is managed for charter by Edmiston & Company.